Because bike lanes are often blocked by delivery vans, building contractors, ride-hailing vehicles, and resident parking, bicyclists must weave in and out of traffic. Bike lanes are a Philadelphia motorist's best friend. They make life better for pedestrians, too. You read that right. You don't have to ride a bike to benefit from bike lanes. Given the polarization and finger-pointing (usually involving the middle digit) that accompanies any discussion of cycling in Philadelphia, it's not surprising that the advantages of the city's bicycle infrastructure have been routinely underestimated. The antibike faction tends to view bike lanes as a special perk solely for the enjoyment of those who travel on two wheels, rather than a way to bring order to the streets. My fellow columnist Stu Bykofsky even suggested recently that the continued existence of bike lanes should be put to a vote — and predicted that they would be roundly defeated. Imagine if someone made the same proposal for sidewalks. Or car lanes. Of course, not all bicyclists follow the rules as well as they should. (What motorist or pedestrian does?) Some cyclists still treat the sidewalks as a de facto bike lane and fail to yield to pedestrians at crosswalks. But eliminating the bike lane network would only worsen the situation. In the interest of furthering tolerance, here are seven ways bike lanes make the streets safer for all travelers, along with a few suggestions for how bicyclists can win more people to their side of the debate. 1. Safety increases when everyone knows their place. In the last few years, several City Council members have blocked new bike lanes, arguing that they would inconvenience neighbors and impede automobile traffic. Motorists often gripe that it's unfair to give up the better part of a lane on Philadelphia's narrow streets to bicyclists, who currently account for 2.2 percent of Philadelphia's commuting population. What opponents overlook is that bike lanes clarify where everyone should be and improve traffic flow. They're like a demilitarized zone in the way they separate the factions: cars, bikes, and pedestrians. Before Philadelphia established its bike lane network, conflicts among those three groups were more extreme. Motorists would tell bicyclists to get on the sidewalk. While I was biking home from work recently, a driver reprimanded me for veering into the car lane. The bike lane happened to be blocked by parked cars, a common problem. Despite his blinkered vision, I took the sentiment as a kind of progress, evidence that bike lanes are considered an integral part of the road network. 2. Bike lanes reduce automobile congestion. Next time you're stuck in traffic, try to imagine what would happen if half the motorists were cyclists. For every commuter who switches from driving to biking, that's one less car on the road. It's similar to the argument we make for supporting mass transit. Philadelphia's narrow, colonial streets could never handle the volume if everyone drove into Center City. More full-time bicyclists also would reduce the competition for parking spaces. 3. Bike lanes are a traffic-calming tool. Last week, Mayor Kenney rolled out his new Vision Zero plan for reducing traffic fatalities. The report rightly recognized that speeding motorists are a leading cause of road deaths and serious injuries, and it recommends redesigning city streets to slow traffic. Evidence has shown that motorists are less likely to speed on narrow streets, or on streets with obstacles, such as speed bumps. Bike lanes similarly narrow the road and force motorists to ease up on the gas. Since the buffered bike lanes on Pine and Spruce Streets were introduced in 2009 by Mayor Michael Nutter, traffic crashes have fallen by more than 30 percent, according to a city official. Bike lanes are a crucial piece of the Vision Zero strategy for drastically reducing traffic deaths. Along with improving bicycle safety on Chestnut Street in West Philadelphia, the new protected bike lane from 45th to 33rd Streets cuts a vehicle lane out of that notorious speedway, says the Bicycle Coalition's Randy LoBasso. It eventually will be extended east to 23rd Street. In Fairmount, Councilman William K. Greenlee continues to block a traffic-calming bike lane on 22nd Street. 4. Bicycles are better for the environment. Bicycling, like walking, produces no significant carbon emissions. If we want less polluted air in Philadelphia, we need to make it easier and safer to commute by bike, especially from neighborhoods beyond the boundaries of Greater Center City. Bike lanes are among the cleanest ways to travel. 5. Bicycling is good for your health. A two-mile commute will burn about 100 calories in 15 minutes. Not only is that competitive with a cardio workout at the gym, it provides an antidote to a long day of sitting in the office. Because some people feel uncomfortable biking in traffic, bike lanes make it easier to enjoy this low-cost form of exercise. 6. Bike lanes help buffer pedestrians from speeding cars. Pedestrians are often just as resentful of bicyclists as motorists, and with some reason. The experience of having a bicycle creep silently up from behind on the sidewalk can be scarier than being cut off by a car in the street, says Deborah Schaaf, who runs Feet First Philly, a pedestrian-rights group. But she firmly believes "bike lanes are not the culprit." Not only do bike lanes encourage cyclists to stay off the sidewalks, they act as a buffer between pedestrians and moving vehicles. As long as cyclists look both ways at crosswalks and yield to pedestrians, bike lanes make Philadelphia a better walking city. 7. Bike lanes are not just for bikes. Many bicyclists won't like hearing this, but bike lanes now serve many constituencies. When parking lanes are replaced with bike lanes, residents can easily pull over to drop off packages and pick up passengers. On religious days, bike lanes provide permitted parking for several Center City churches and synagogues, making it easier for those fragile institutions to survive. Bike lanes have been a boon for quick stops by delivery trucks and building contractors, who no longer have to hunt for parking. 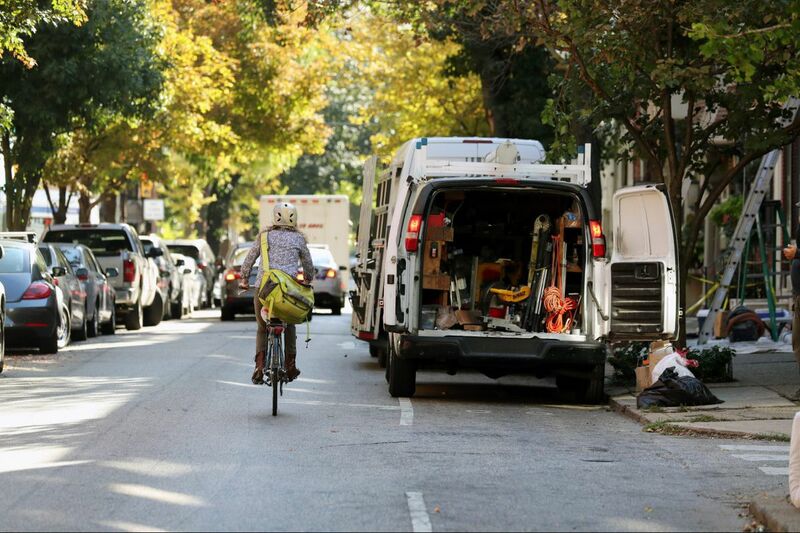 A bicyclist weaves into traffic to avoid a parked van in the bike lane on on Pine Street. The problem is, these not-unreasonable side uses are easily abused. The frequent blockages increase the danger for cyclists by forcing them to weave in and out of car lanes. Motorists can't like that unpredictability, either. The Bicycle Coalition has been lobbying for protective poles on Lombard and Spruce Streets along the separation line to discourage the temporary parking but has been thwarted by residents and City Council members. More zealous ticketing may be a good compromise. As the number of bike commuters grows in American cities, so does the backlash — or bikelash — against designated lanes. But if the current trend continues, it's likely the percentage of bicyclists will start to rival that of motorists and pedestrians. Maybe then we'll stop hearing that bike lanes are unnecessary.